I'd checked out The Southern Spirit before, but this time I thought I'd chase it across the state. It's inaugural 2011 voyage was to be from Adelaide to Brisbane starting over the weekend of the 29th and 30th of January. This train, run by Great Southern Railways, is a once-a-year (although it'll be running the 'journey' twice this year) special service run from Adelaide to Brisbane and return. It's quite a long trip and the journey includes stopovers at stations along the way; including bus tours to local attractions. The train is targeted at people with a large amount of disposable income and a lot of time to spare... you can therefore imagine the average age of the passengers on-board is around 65. 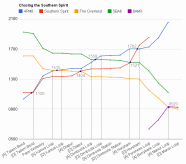 Check out more information on The Southern Spirit on the GSR website. 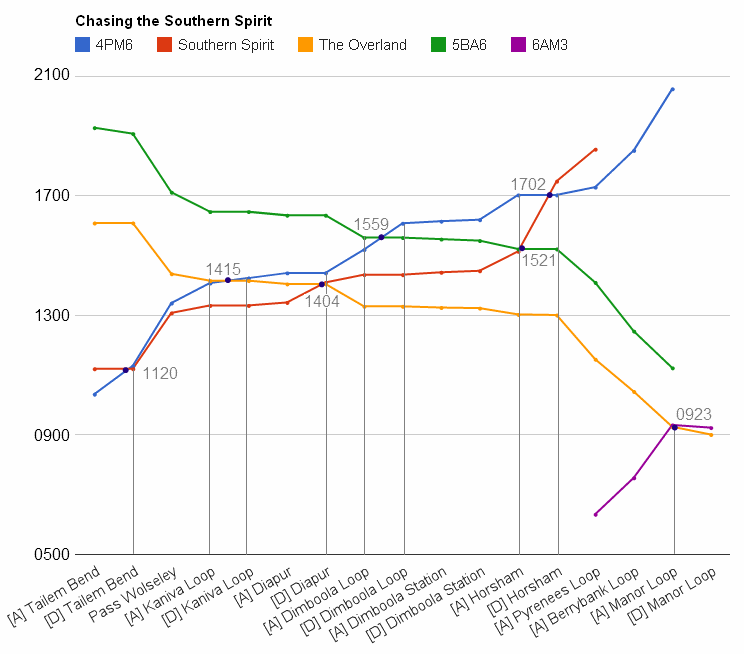 I'd done a little investigation and found that The Southern Spirit was to cross 2 freight trains (one twice) and then The Overland. I knew The Overland would be more-or-less on time (when compared to freight) and so decided to start my planning around it. I'd leave Melbourne bright and early and get to Ararat in time for a midday photo of The Overland dropping through. I'd then head west, watch it meet The Southern Spirit and then return home. The Southern Spirit was to stay overnight out west and I would catch up with it again in Melbourne the next morning. I drew up a diagram, similar to a 'diamond' (a popular Japanese method of showing train paths intersecting), of the trains that would be around the area for Saturday. The y-axis was slightly useless, so I labeled the passing locations and times. Note that 4PM6 didn't show the standard times as it had been modified by ARTC to stop in certain loops to allow trains to pass it. I'd also listed Manor Loop in there, as The Overland was scheduled to pass a freighter; but I've never seen this happen and probably wont get up early for it. The goal was now set, I was to get to as many of the passes as possible. I also wanted to stop at locations along the way to get the trains in action. Unfortunately, I've never been this way and had no idea where to stop. I also had to make sure I kept to the times as most services would have an NR locomotive on the front and they aren't scared to do line-speed. ## Seems the Regional Fast Rail to Ararat can beat me from Beaufort to Ararat. ** Check that out, The Overland is still meant to be at Ararat Station until 1147 but I need to get going at 1140 (based on Google's time estimate) to see it at the pass The Southern Spirit at 1404 at Diapur Station. After google'ing the locations, directions, distances and times... it occured to me that catching all of the above passes would be quite a challenge. If the trains did in-fact run at their tabled times, then I would pretty much be neck-and-neck with them along each leg. This wouldn't allow time for any in-between shots. Fortunately I'd still be just-in-time for the passes in each of the loops. Determining the locations of the 'loops' versus the 'stations' was a little tricky. Fortunately the Vicsig Website has a complete detailed plan of the 'Western SG' line and gives you the distances of the loops from certain landmarks. Google maps didn't know where 'Dimboola Loop' was, but after a little research I found out it was around 5km north/west of Dimboola. It also looked quite difficult to get to from the Western Highway, so I decided to skip the 1559 passing of 4PM6/5BA6 and instead chose to wait for the latter at Dimboola Station. Now, planning is all well and good when the trains follow their paths... unfortunately this isn't always the case. The Gheringhap Loop Sightings Website has a well-documented list of train movements through the Gheringhap Loop (near Geelong) and it shows, specifically last Saturday, that the two east-bound trains were up to 6 hours late, with 4PM6 being 1.5 hours early. This, to say the least, is disconcerting. The contingency plan was to take all roads as close to the railway as possible and keep an eye out for anything out of the ordinary. Note: The entire photo gallery of this trip is located here. The plan was in place and we started out for Ararat at 7am on Saturday the 29th of January, 2011. Our first stop was Ballan and this was made in good time. Google had indicated over an hour, but the trip was easily done, without speeding, in 55 minutes. Here we saw a single V/Line V/Locity DMU arrive on it's way to Melbourne. There's also a nice water tank in the Station carpark. We then proceeded to Beaufort, bypassing Ballarat. Here we met the first service from Melbourne to Ararat. Again, the trip was quicker than what Google had predicted as the roads were all 110km/h running and quiet. We then departed for Ararat. There was no chance of beating the V/Locity there and so we took our time. The Overland wasn't due in Ararat until 11:47 and we were easily going to be there an hour early. As we arrived we saw the V/Locity terminated on the platform and used it as an excuse to check the station platforms out. After grabbing a coffee in the main street we attempted to find a suitable position to photograph The Overland. We would need a quick departure from Ararat to meet The Overland again as it had priority on the tracks. The next station would be Horsham which was around 100km away. Although the sun wasn't in our favour, we chose a spot on the other side of the railway, close to the highway. I also chose the wrong lens, but got a few photos of The Overland arriving at Ararat 20 minutes early. We didn't wait for The Overland to leave... we jumped in the car and headed for Horsham. Unfortunately the roads were all 100km/h and we were passed by The Overland about 20km out of Ararat. We hadn't had any visibility of the rails for around 40km prior to Horsham, but had expected that all hope was lost. It was a nice surprise that, upon arrival to the station, we found passengers waiting for the train. There were even a few freight locomotives shunting around the yard. And then The Overland arrived. We, again, didn't give it a chance to leave before us... We knew what it was capable of and needed a head start. This was the best part of the trip. The drivers were on to us, they knew we were tagging along. They also made us know that they were perfectly capable of beating us... blowing their horns as they passed us on the highway. The rail between Horsham and Dimboola runs parallel for 90% of the way and is great when you're running side-by-side. Unfortunately The Overland had no intention of hanging around. We then fell behind quite heavily and watched as the train seemed to drive across the road around corners... it really is a great sight. We proceeded to Dimboola hoping to go straight through and get another head start. As we came in to the town we knew we'd been beaten. The level crossing was already quiet and, as we crossed it, we saw the tail of the train in the platform. This meant we had around 2 minutes to get in front of it. Finally the sun was on our side and we parked a few metres west of the station to watch the train depart. We had decided to proceed through to Dimboola Loop. I'd known, thanks to the Vicsig website, that it was around the AWB facilities near Dimboola, but from the road, it wasn't easy to spot. Either way, we saw no trains around the area. We continued on, expecting to travel as far as Nhill. As we were around 25mins west of Dimboola, a headlight appeared on the tracks. The last thing we expected was dirty NRs on a freight train, but there was 4PM6 hurtling towards us. The Overland had already passed it, somewhere west of Dimboola Loop and the freighter had already built up speed and was heading for it's scheduled stop in Dimboola. This train was expected to be held back at Tailem Bend and was meant to run behind The Southern Spirit until Horsham but had instead been allowed to proceed. We then pulled a strategic u-turn and followed the freight back to Dimboola. This was an easy chase, as the freighter was unable to hold 100km/h on the gradients. We got back to Dimboola in time and had the sun on our side for once. I had a quick chat to the driver who confirmed it was 4PM6 and that The Southern Spirit was due through not long after. The drivers swapped over and the freighter departed quickly. We then waited around for our first sighting. Around 35mins later we could hear an NR powering its way towards Dimboola. A headlight then appeared over the incline from the west and the next thing we knew, the whole train had passed. We had seen that the signal was green and that the train didn't have to stop but, after the freighter crawled though, we weren't expecting line-speed. I managed to scramble a few photos but, even in broad daylight, the motion blur couldn't be avoided. We had now finally seen the train and followed it back to Horsham. There was absolutely no chance of beating it and we knew it was to stable for around 3 hours there. As we were arriving back in to Horsham, we saw the tail of the train... It was doing around 10km/h towards the first level crossing in the town which was still inactive. After hitting it's horn, the lights and bells started chiming and it proceeded further. Fortunately, we were doing 60km/h and easily made it to the station before it. The train had to take two attempts to get everyone off. I believe I counted 16 cars and there was no way it would fit on the platform at once. There was an El Zorro grain train with T386 and C501 playing around in the container yards as well. After arriving much too early at Ararat, we decided that it was time to return back to Melbourne; we'd see the train again in the morning. I assumed my usual position at the North Melbourne flyover and met a few new people who were also waiting for the same train. The XPT arrived on time and then the Southern Spirit arrived, attached it's pilot loco and then proceeded to Southern Cross Station. The consist then made its way back to the freight yards after dropping the passengers off. The pilot loco did all the work here over the flyover. The XPT also started its return journey to Sydney. The consist then sat in the freight yards for around two hours. I had enough time for breakfast and then returned to the Canal Sidings to watch it come back into Southern Cross. The final trick then was to get out to the bridge over the same "Railway Canal" near Jacana. This should have been an easy shot but I chose the wrong lens again. Either way, it was a great way to end the chase. The Southern Spirit will return via Melbourne and be at Southern Cross at around 7pm on Tuesday the 8th of February. The pilot locomotive will be attached at the same location but will be detached well out of town. This will be well worth a photograph or two and I'll attempt to get them next week. The whole journey from Adelaide to Brisbane and return is also to be repeated, starting on the weekend of the 12th and 13th of February. I'm not so sure if I'll cover the 1000km again, but you never know, there might be other interesting things to see in the area.